Aim: The aim of this study was to see the usefulness of immunohistochemistry in diagnosing salivary gland tumors found in a tertiary health institution. Materials and Methods: Twenty-six formalin-fixed paraffin embedded salivary gland tumors were accessioned, and 2 μm were sectioned and processed using Streptavidin-Biotin immunoperoxidase method. Results: Adenoid cystic carcinoma (ADCC) was positive to alpha-smooth muscle actin (α-SMA) while mucoepidermoid carcinoma (MEC), polymorphous low-grade adenocarcinoma (PLGA), squamous cell carcinoma (SCC) and oncocytic carcinoma (OCC) were all negative to it. 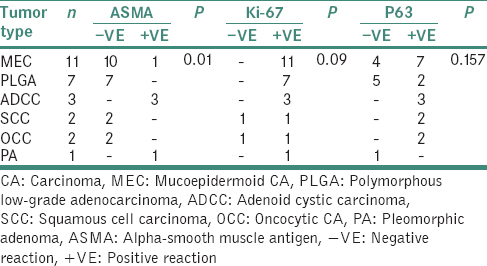 MEC, PLGA, ADCC and the only pleomorphic adenoma (PA) were positive to Ki-67 while both SCC and OCC were negative to it. All the tumors except PA were positive to p63. Conclusion: It appears that α-SMA may be used to distinguish ADCC from MEC and PLGA, but Ki-67 cannot be used for this purpose. Furthermore, p63 cannot help in the diagnosis of ADCC, MEC or PLGA. It was concluded that immunochemistry can be used as adjunct to routine H and E stain in the diagnosis of the various salivary gland tumors. Salivary gland tumors are important tumors in oral and maxillofacial practice, and malignant tumors account for about 3% of head and neck malignancies. The salivary glands consist of three major paired glands (parotid, submandibular and sublingual) and minor glands located in the mucosa of palate, lips and the respiratory tract. Each gland consists of acini (serous, mucinous or mixed) and ducts (intercalated, striated and excretory). The basic cellular components of the gland are surrounded by myoepithelial and/or basal cells. There are also ductal epithelial cells lining the lumen of the ducts. Most of the salivary gland tumors originate from these surrounding cells and ductal epithelial cells. There are various theories regarding the morphogenesis of the various neoplasms of salivary glands particularly among biphasic tumors such as pleomorphic adenoma (PA), adenoid cystic carcinoma (ADCC) and polymorphous low-grade adenocarcinoma (PLGA). We, therefore, undertook this study to access the role of α-SMA, Ki-67 and p63 monoclonal antibodies in the diagnosis of complex salivary gland tumors previously diagnosed with H and E stain in our center for over a period of 7 years. All the salivary gland tumors in the oral pathology file were accessioned and reviewed, and twenty-six that met the criteria for selection for immunostaining were included in this study. They were classified according to the WHO classification of 2005. All tissue samples were previously fixed in 10% neutral buffered formalin and embedded in paraffin wax blocks. The immunostaining agents used were anti-α-SMA, Ki-67 and p63. Avidin-Biotin Complex method was used. All antibodies used were manufactured by Novocastra (Novocastra product now owned by LEICA). ELIZA method was used, and manufacturer's instruction was strictly followed. For each reaction, it was reported either positive (when there was reaction) or negative (no reaction). When positive, it was graded mild (+1), moderate (+2) or intense (+3) depending on the intensity and extent of the positive reaction. Statistical analysis was done with SPSS version 20; descriptive statistics (frequency, tables) were done. Association between variables were accessed with Chi-square and P < 0.05. The salivary gland tumors consisted of 25 malignant lesions (11 mucoepidermoid carcinomas [MECs, [Figure 1], 7 PLGAs [Figure 2], 3 ADCCs [Figure 3], 2 squamous cell carcinomas [SCCs, [Figure 4] and 2 oncocytic carcinomas [OCCs], [Figure 5]) and only one benign lesion, PA, [Figure 6]. Ten of the MEC were negative to α-SMA. One had intense nuclear and cytoplasmic positivity. All the PLGA were negative to α-SMA while the three ADCC were all positive to α-SMA. The two SCC and the OCC were negative to α-SMA. The difference between the ADCC positivity to α-SMA and that of MEC or PLGA was statistically significant (P = 0.01). The only PA was positive to α-SMA. The positivity was both nuclear and cytoplasmic positivities [Table 1]. One of the MECs was slightly positive to Ki-67, while eight were moderately positive and two were markedly positive. All the PLGA were positive to Ki-67. Five were moderately positive while two were markedly positive. As regards the reaction of SCC and OCC to Ki-67, one was mildly positive while the other was negative, respectively. The only PA was moderately positive to Ki-i67. The difference in the positivity between MEC, PLGA and AdCC to Ki-67 was not statistically significant [Table 1]. Four of the MEC were negative to p63, one was mildly positive while six were moderately positive to p63. Five PLGAs were negative to p63 one was mildly positive, and one was moderately positive to p63. Two ADCC were moderately positive while one was markedly positive to p63. The 2 SCCs were mildly positive to p63. The 2OCCs were moderately positive to p63 while the only PA was negative to p63. The positivity of all tumors to p63 was not statistically significant [Table 1]. In this study, all the PLGAs were negative to α-SMA; this is in conformity with many previous reports that myoepithelial cells do not play a part in the histogenesis of PLGA. However, some authors have reported otherwise., Jones et al. in a study of the immunoreactivity of α-SMA observed focal staining in 5 out of 6 PLGA. In addition, Norberg et al. observed ultrastructural features of myoepithelial cells in 1 out of 3 PLGA. In this study, all the MEC were positive to Ki-67 though to various degrees (1 mildly, 8 moderately and 2 markedly). Ki-67 is a marker for cell proliferation. It is also a prognostic indicator in malignancy. It has been shown that the degree of staining correlates with the malignant grade of the MEC.,, This may explain the different degrees of staining observed in this study. Five PLGAs were moderately reactive while two were markedly reactive to Ki67. Saghravanian et al. reported that both ADCC and PLGA were both reactive to Ki-67 and therefore cannot be used to distinguish between the two lesions. Our finding in this study is similar to that of Saghravanian et al. One SCC and one OCC were negative each to Ki67 while one SCC and one OCC were mildly positive to Ki67. The only PA was moderately positive to Ki67. Positivity of PA to Ki67 have been reported. In this study, out of a total of 11 MEC, 4 were negative to p63 one was mildly positive while 6 were moderately positive to p63 which is in conformity with previous reports showing MEC marked sensitivity to p63., P63 is a p53 homolog which participate in the development of epithelium and bone. Sams et al found the strong positivity of MEC to p63 while comparing its reactivity with acinic cell carcinoma. Fonseca et al. also found great positivity of MEC to p63 compared to papillary cystadenoma lymphatosum and mucus retention cyst whose reactivity was limited to basal cells. Weinreb et al. while comparing the positivity between OCC/oncocytoma with MEC reactivity to p63 found that MEC reactivity was more than 50% while in oncocytoma/oncocytic CA was just scanty. The two SCC and the two OCC were positive to p63. P63 has positive reactivity to SCC. The positivity of OCC is at variance with the report of Weinreb et al. that showed its negativity to p63. The α-SMA can be used to differentiate MEC and PLGA from ADCC but Ki-67, cannot be used to differentiate MEC from ADCC or from PLGA. Immunostaining can be used as adjunct to H and E staining for diagnosis of salivary gland tumors. Regezi JA, Scuibba AJ, Jordan RC. Oral Pathology, Clinical-Correlations. 4th ed. Philadephia; WB Saunders; 2003. p. 217-50. Eveson JW, Auclair P, Gnepp DR, El-Naggar AK. Tumours of the salivary glands. In: Barnes L, Eveson JW, Reichart P, Sidransky D, editors. Pathologyand Genetics of Head and Neck Tumours World Health Organization Classification of Tumours. Vol. 9. Lyon, France: IARC Press; 2005.p. 210. Nikitakis NG, Tosios KI, Papanikolaou VS, Rivera H, Papanicolaou SI, Ioffe OB, et al. Immunohistochemical expression of cytokeratins 7 and 20 in malignant salivary gland tumors. Mod Pathol 2004;17:407-15. Meer S, Altini M. CK7+/CK20- immunoexpression profile is typical of salivary gland neoplasia. Histopathology 2007;51:26-32.
de Araújo VC, de Sousa SO. Expression of different keratins in salivary gland tumours. Eur J Cancer B Oral Oncol 1996;32B: 14-8. Tatemoto Y, Kumasa S, Watanabe Y, Mori M. Epithelial membrane antigen as a marker of human salivary gland acinar and ductal cell function. Acta Histochem 1987;82:219-26. Foschini MP, Scarpellini F, Gown AM, Eusebi V. Differential expression of myoepithelial markers in salivary, sweat and mammary glands. Int J Surg Pathol 2000;8:29-37. Zhu S, Schuerch C, Hunt J. Review and updates of immunohistochemistry in selected salivary gland and head and neck tumors. Arch Pathol Lab Med 2015;139:55-66. Yang A, Schweitzer R, Sun D, Kaghad M, Walker N, Bronson RT, et al. P63 is essential for regenerative proliferation in limb, craniofacial and epithelial development. Nature 1999;398:714-8. Gugliotta P, Sapino A, Macrí L, Skalli O, Gabbiani G, Bussolati G, et al. Specific demonstration of myoepithelial cells by anti-alpha smooth muscle actin antibody. J Histochem Cytochem 1988;36:659-63. 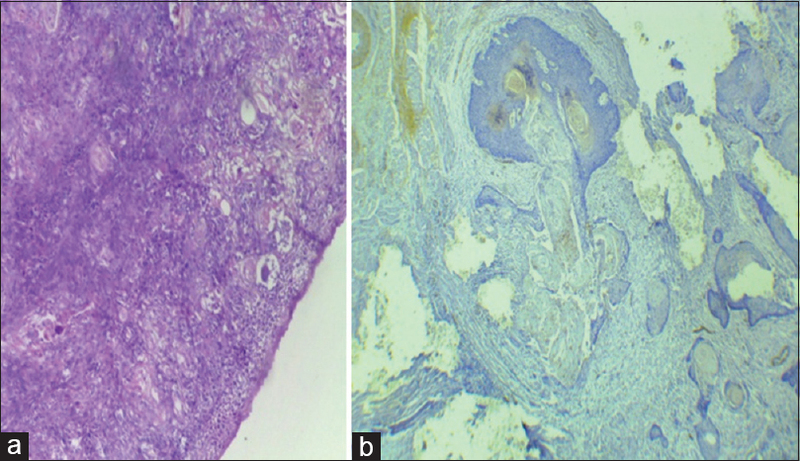 Saghravanian N, Mohtasham N, Jafarzadeh H. Comparison of immunohistochemical markers between adenoid cystic carcinoma and polymorphous low-grade adenocarcinoma. J Oral Sci 2009;51:509-14. Zarbo RJ, Regezi JA, Batsakis JG. 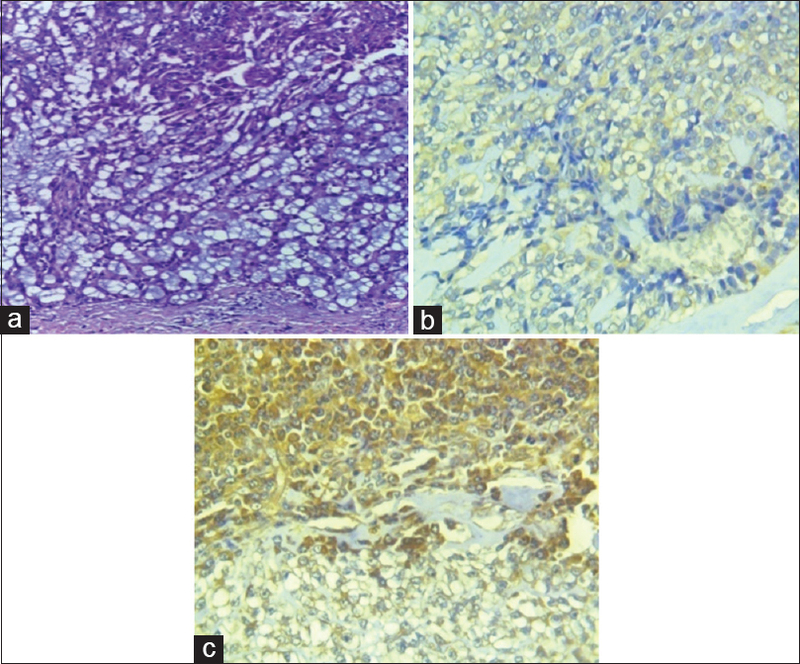 S-100 protein in salivary gland tumors: An immunohistochemical study of 129 cases. Head Neck Surg 1986;8:268-75. Franquemont DW, Mills SE. Plasmacytoid monomorphic adenoma of salivary glands. Absence of myogenous differentiation and comparison to spindle cell myoepithelioma. Am J Surg Pathol 1993;17:146-53. Dardick I, Stratis M, Parks WR, DeNardi FG, Kahn HJ. S-100 protein antibodies do not label normal salivary gland myoepithelium. Histogenetic implications for salivary gland tumors. Am J Pathol 1991;138:619-28. Regezi JA, Zarbo RJ, Batsakis JG. Immunoprofile of mucoepidermoid carcinomas of minor salivary glands. Oral Surg Oral Med Oral Pathol 1991;71:189-92. Matsushima R, Nakayama I, Shimizu M. Immunohistochemical localization of keratin, vimentin and myosin in salivary gland tumors. Acta Pathol Jpn 1988;38:445-54. Jones H, Moshtael F, Simpson RH. Immunoreactivity of alpha smooth muscle actin in salivary gland tumours: A comparison with S100 protein. J Clin Pathol 1992;45:938-40. Norberg LE, Burford-Mason AP, Dardick I. Cellular differentiation and morphologic heterogeneity in polymorphous low-grade adenocarcinoma of minor salivary gland. J Oral Pathol Med 1991;20:373-9. Morinaga S, Nakajima T, Shimosato Y. 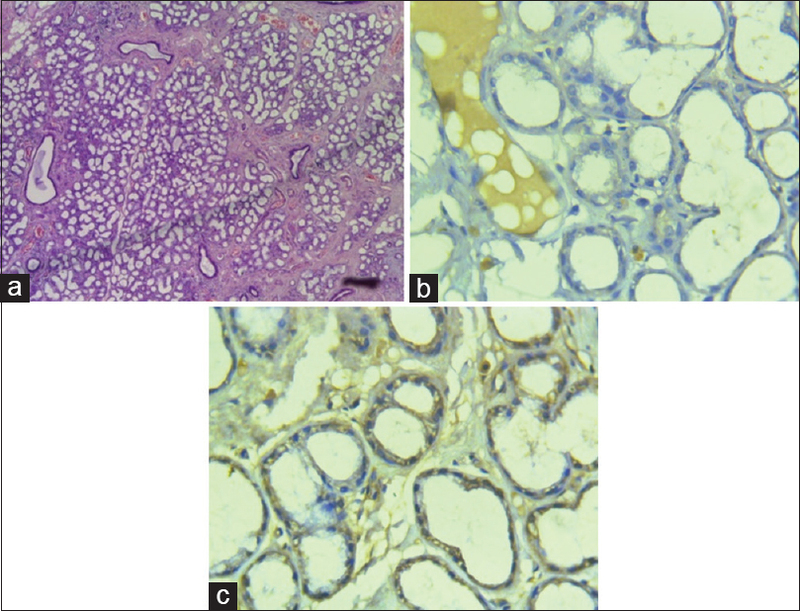 Normal and neoplastic myoepithelial cells in salivary glands: An immunohistochemical study. Hum Pathol 1987;18:1218-26. Kahn HJ, Baumal R, Marks A, Dardick I, van Nostrand AW. Myoepithelial cells in salivary gland tumors. An immunohistochemical study. Arch Pathol Lab Med 1985;109:190-5. Sams RN, Gnepp DR. P63 expression can be used in differential diagnosis of salivary gland acinic cell and mucoepidermoid carcinomas. Head Neck Pathol 2013;7:64-8. Dardick I, Daya D, Hardie J, van Nostrand AW. Mucoepidermoid carcinoma: Ultrastructural and histogenetic aspects. J Oral Pathol 1984;13:342-58. Dardick I, Gliniecki MR, Heathcote JG, Burford-Mason A. Comparative histogenesis and morphogenesis of mucoepidermoid carcinoma and pleomorphic adenoma. An ultrastructural study. Virchows Arch A Pathol Anat Histopathol 1990;417:405-17. Gnepp DR, Chen JC, Warren C. Polymorphous low-grade adenocarcinoma of minor salivary gland. An immunohistochemical and clinicopathologic study. Am J Surg Pathol 1988;12:461-8. Zhu X, Zhang J, Chen X, Feng X. 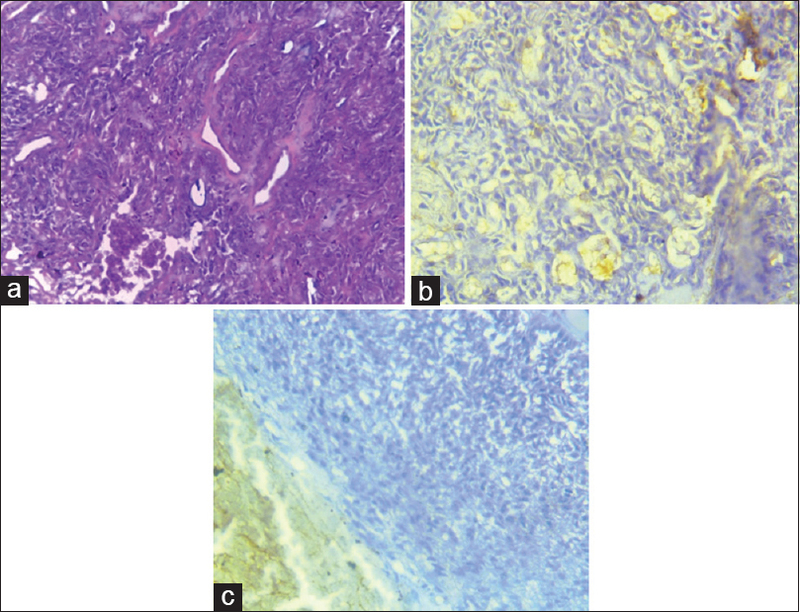 Comparison of ki-67, cyclin E, and p63 in benign and malignant human pleomorphic adenoma. Oral Surg Oral Med Oral Pathol Oral Radiol 2012;113:667-72. Fonseca FP, de Andrade BA, Lopes MA, Pontes HA, Vargas PA, de Almeida OP, et al. P63 expression in papillary cystadenoma and mucoepidermoid carcinoma of minor salivary glands. Oral Surg Oral Med Oral Pathol Oral Radiol 2013;115:79-86. Weinreb I, Seethala RR, Perez-Ordoñez B, Chetty R, Hoschar AP, Hunt JL, et al. Oncocytic mucoepidermoid carcinoma: Clinicopathologic description in a series of 12 cases. Am J Surg Pathol 2009;33:409-16. Perez-Ordonez B, Linkov I, Huvos AG. Polymorphous low-grade adenocarcinoma of minor salivary glands: A study of 17 cases with emphasis on cell differentiation. Histopathology 1998;32:521-9. Beltran D, Faquin WC, Gallagher G, August M. Selective immunohistochemical comparison of polymorphous low-grade adenocarcinoma and adenoid cystic carcinoma. J Oral Maxillofac Surg 2006;64:415-23. Prasad ML, Barbacioru CC, Rawal YB, Husein O, Wen P. Hierarchical cluster analysis of myoepithelial/basal cell markers in adenoid cystic carcinoma and polymorphous low-grade adenocarcinoma. Mod Pathol 2008;21:105-14.